John Purple, Jr. matched his winning performance of last year with a repeat victory in the 2005 Henlopen Conference Tournament on May 25, in miserable, wet, rainy, windy conditions. And well he should be. The other Vikings struggled in the tough conditions. Jason Hastings shot an 89, and Andrew Schneider scored a 96. Alex Hatter finished with 99, and Travis Parker, fighting back from illness, scored a 103. Samantha Purple shot a 45-60 for her first Conference tournament. R.W. “Charlie” Engel is 92 years young, and has been playing golf since he was 50. The former Army colonel and professor at Virginia Tech had his first hole-in-one at the ripe age of 83. Engel topped that feat on May 3 at Marsh Island Golf Club, with his second hole-in-one on the par-3 135-yard third hole. 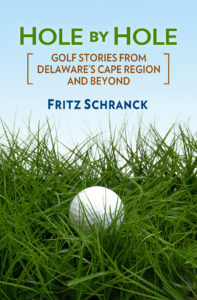 He is by far the oldest golfer I’ve known to score an ace, and he may be the oldest ever in Delaware sports history. “I used a five-wood,” Engel said recently. “I was playing with my son-in-law [Dr. Matthew J. Barlow, Jr.] and a friend of mine [Avon McCauley], and they hit first. Both of them were lying close to the hole. They said mine was going right at it. I turned away, and it rolled in while I wasn’t looking,” he said. Engel said he is also researching the question about who might be the oldest ace-maker, and promised to let me know if his apparent record stands. There can’t be too many other contenders. Popular PGA and Champions Tour veteran Peter Jacobsen came to Rehoboth Beach on May 23 to help raise money for the Delaware State Golf Association’s scholarship fund. The main event featured seven golfers playing nine holes on the front nine with Jacobsen, with one amateur foursome matched up against Jacobsen and three more amateurs in a scramble format. Another group of seven more golfers played the same format on the back nine. Cape region golfers and others pledged money for each birdie scored during the round, and the 14 total birdies helped. Barrows said the event raised approximately $18,000, which will go to several deserving college scholarship candidates. The winners will be announced at the Rehoboth Beach Junior Open in mid-June. Pete Oakley’s string of new experiences on the Champions Tour continued during the Bruno’s Classic in Birmingham, Alabama May 20-22, but this time it was really painful. Oakley’s son Zac is joining him this weekend for the PGA Seniors Championship at Ligonier, Pennsylvania. The ribs are still sore, and he’s sporting a large bruise, but Oakley remains optimistic.